What personal item do you cherish most? Before I met this ring, I never really wore jewellery. It caught my eye on a cold winter day while I was strolling through the Chateau Lake Louise in Banff National Park (where I worked) with a good friend (Carly!). I can’t remember what we were doing there at the time, but neither of us had the intention of buying anything. There was something calming and pleasing to me in the design. 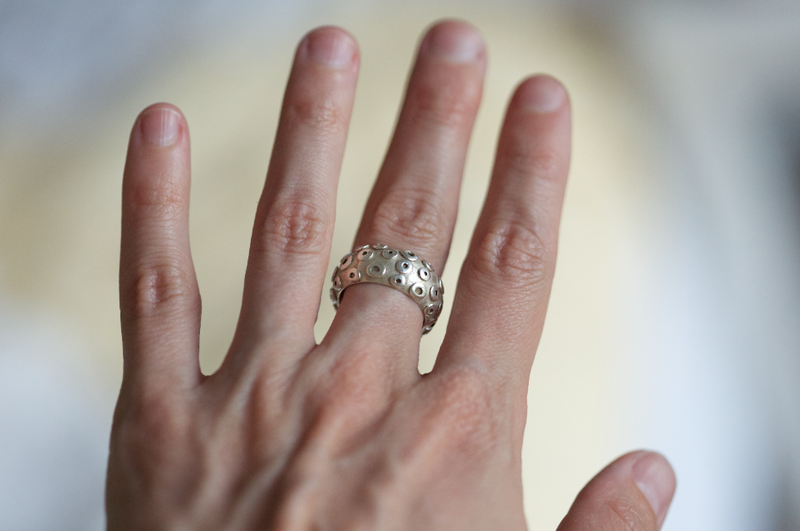 It was modestly priced for silver and fit my nimble (child like) fingers perfectly. I think I paid about $32.00 for it. Do you have a personal item that you love? Where did you find it? I’ve been wearing this ring on my hand now for nearly 8 years. (Carly if you’re reading correct me if I’m wrong). It’s the only thing apart from my tattoo, that has stayed with me this long unchanged. I feel safe with it on. Mike and I were sitting in a natural hot spring on the side of a mountain road once and we saw the chemical change of silver and sulphur mixing. The ring changed into a dramatic beautiful blue/red/copper temporarily. It recently changed colour when I cleaned it in some boiling water, with aluminium, sodium bi carb and vinegar… to this soft pale creamy silver. I’ve fiddled and spun it on my finger in a sort of trance while I’ve been in a waiting line…and it’s given me great grief if It’s ever slipped off or I’ve misplaced it. Like losing my mind grief. Never in the history of loving an inanimate object has someone loved a thing as much as me and this ring. This entry was tagged australia, Canada, Cherished Items, Fashion, Jewellery, Lake Louise, Macro Photography, minimalism, minimalist design, Silver, simple designs, Trends. Bookmark the permalink. yes I have a few and most are like yours jewelry. What is it about them that you like? The colour, shape, design? I think the most important aspect is its comfort – it should not feel like an alien object, but something you only perceive visually. Of course design is important, especially design that flows. I dislike things that are pretty only until you put them on. I have become a bit more discerning in jewellery than I used to be, but still love all my old bits and pieces that have good associations with their origins. That is a beautiful ring. I think an attachment to well-crafter, distinctive jewellery is very common. I have a daughter who is a goldsmith, and she gets some beautiful letters from her clients about how attached they are to her pieces (as am I). That would be such a creative and inspiring skill to have. I’ve always admired the precise technical detailing in jewellery. Does she have a website? Sorry that I was unable to finish my comment to you yesterday… family interruptions. I have a necklace and earring set of sliver and orange amber that I just love. It was like your ring not really expensive but I just love how the amber glows and the tear drop shape looks nice. I also have to say that I thought about your post off and on all day. I also have a collection of plates… some collector, some antiques, some from thrift stores, blue ones green ones some with images of horses, some with castles that I have had for 26 years and keep adding to. I love them too. They really are more about my life and my travels then just something I find pretty but they are much harder to move around. You have made me want to write about this topic also… so I will be linking to this post very soon. Thanks Holly you made me think today! A fellow collector! Nice, what was it that caught your attention when you decided to start collecting plates? I have a few special tea cups that I’ve bough second hand that I just love to bits. I found the first one in Melbourne in an op shop. It was beautiful so I paid 20$ for it and now it’s forever travelling with us when we move. I’m glad the post inspired you to think about much loved items. Your necklace also sounds beautiful. That is a really cool concept. Even just the walking in the woods part appeals to me… I’m headed to your blog right now! Thanks Jolynn!